Have you often wondered how to make mead, but were afraid to try? Then, we have something just for you! 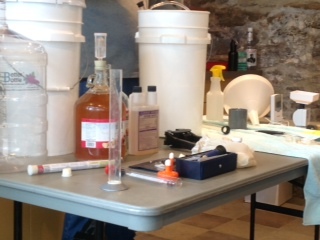 A short “Introduction to Mead Making” demonstration will be held. Written feedback on homebrew entries is provided on a first come, first served basis. Verbal feedback will be provided for all entries as each is shared amongst the group. You must be present to receive your feedback. Wyck 1-4 pm Wed. Sep. 7 – Fri. Sep. 9 OR 9- noon on Sat. Sep. 10. The Colony Meadery, Allentown PA, no later than August 31. The Colony Meadery will have a booth set up with commercial mead for tasting and purchase. Mike Manning, Co-founder and Mead Maker at The Colony Meadery, will comment on the flavor profiles of your entries and provide feedback on how you can achieve your desired outcome. Michael will make his written assessments while you enjoy the fest. Convene in the Rose Garden at 12:30, taste a few sips of the home brews, and listen to Michael’s educational feedback on all the entries.